Positive associations: psychic ability, mystery, intuitiveness, understanding, wisdom, the divine feminine. Negative associations: emotional insecurity, lack of intuitiveness, secretiveness, opponents or hidden obstacles. The High Priestess is the guardian of secrets. When she appears in a tarot reading it can mean a secret will soon be revealed or that there is a secret you hold and would like to reveal. Symbolizing our the realms of our unconscious and intuitiveness, the High Priestess Tarot Card is our guide to our potential and our inner self. When the High Priestess Tarot Card appears it can suggest that you should let your intuition be your guide and more importantly, trust your instincts. She can even represent a person who will provide advice and wise counsel. During a man’s reading the High Priestess Tarot Card can often represent the most important woman in his life. His wife or partner, or his mother or sister. The can sometimes even be a very close female relative or friend. The negative aspect of this card could represent a female who is a bad influence on him. Negatively the High Priestess can often represent emotional insecurity. It also holds the warning of the danger of being tempted to use emotional blackmail. Furthermore, it can mean that a secret is being kept from you. These could be unknown obstacles or opponents. 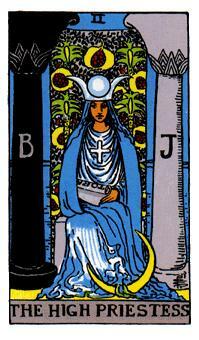 The High Priestess card is one of the Major Arcana cards in a traditional Tarot deck. Some of the many aliases that she is known for include Persephone, Isis or Artemis. Originally, the High Priestess card was called La Papessa, referring to the legend of Pope Joan. She is depicted as sitting before the great mystery, which is indicated by the Tree of Life in the background. The High Priestess is sitting between the light and darkness, placing her in the role of the mediator. The tapestry that is hung between the pillars serves to hide everything from those that are not initiated. The pattern on the tapestry is one of pomegranate, which is indicative as a symbol of Persephone. The robe on the High Priestess is blue, the symbol of knowledge. The crown on the head is the crown of Isis, the Triple Goddess. The solar crest on the chest is an indication of balance between the male and female. In her lap, the High Priestess holds a half hidden, half revealed Torah, representing higher knowledge and the esoteric and exoteric teachings. The moon that is under her left foot shows a dominion over pure intuition. The palm is indicative of the fertility of the mind, while the cube that the High Priestess sits on is a representation of the Earth. High Priestess is associated with the planet Moon. The High Priestess or La Papessa, in the Visconti-Sforza Tarot has been identified as a depiction of a historical figure the Sister Manfreda, an Umiliata nun who was elected as a Pope by a heretical Guglielmite sect of Lombard. In the Vikings Tarot, the High Priestess is represented as Frigg, the wife of Odin. In Golden Tarot, she is depicted as a Papess. The High Priestess, in the Mythic Tarot is presented as a Persephone. The Asteroth Tarot portrays the High Priestess as bathed in the energy of a crescent moon. One of the more popular tarot decks today, the Osho Tarot, refers to this card as the Inner Voice. The High Priestess is a quiet person surrounded by two dolphins, a crescent moon and water. There is a circle face in her center and she holds a crystal in both of her hands. The High Priestess represents knowledge, wisdom, serenity and understanding. This card in Tarot holds the widest range of interpretations because she is often described as the guardian of the unconscious. The High Priestess tarot card represents the unconscious, the deep desire to dive in deep into the mind and discover the powers that are hidden inside each of us. These powers are the source power that is used by the Magician. This allows the Will of the Magician to focus his power in the outer world to transform and create whether he desires. These two Tarot cards, the Magician and the High Priestess balance each other between the potential and creation and between the masculine and feminine principle in the world. The power that the High Priestess uses transforms on the inner level. Those transformations don’t have a great outward representation, but happen quietly on the inside, allowing them to be more powerful in transforming us. The High Priestess has a deep, intuitive knowledge and understanding of the Universe and the hidden truths. She uses her power to teach. The High Priestess is not one that will control and manipulate. Representative of the unconscious, the hidden world, intuition, symbols and dreams, the way to access your subconscious mind is trough intuition and dreams. Paying attention trough your dreams is important when the High Priestess tarot card appears in a reading, implying that the solution comes from intuition and not from intellect. For males, the card of the High Priestess represents his Anima or female side that he needs to get in touch in order to grow.The High Priestess guides women to trust their intuition and to use their feminine side, not to succumb to the pressures of the world today and start behaving more masculine thus rejecting her femininity. The High Priestess tarot card also represents the unknown and an indication that this is a time of change. You start to realize that nothing in life is certain, all that has been hidden starts to become clearer and your intuition starts to grow. Generally, the appearing of this card, the High Priestess in the tarot reading indicates a need for the listening of your inner voice and trusting it. Interpretation of a High Priestess Tarot card is one of the hardest in the Tarot reading. The meaning of the card changes depending on various factors like the type of reading or the person being read for. In a reading about love, the High Priestess may represent a person that the person being read for is interested. It may represent a man’s ideal woman or it may indicate that this person is attractive, yet mysterious. The High Priestess may also represent he person that is being read for, showing that he or she is keeping something hidden. This card can also often represent the card reader or the asker, as this card is representative of secrets being hidden or revealed. For a man, it can represent his ideal woman and for a women it can represent her being independent and without a relationship. In a reading about work, the High Priestess can be indicative of developing your own ideas and refining your work. Unlike other cards, this card can advocate a need to keep certain things hidden for the time being. Health wise, the High Priestess indicates an unknown factor which must be addressed in order for the healing to occur. As a general interpretation, the High Priestess appearing in the tarot reading indicates that the person has great inward balance. The querent has a total understanding of the situation that they are in because of their developed inner voice. The High Priestess is in an upright position indicates a time of letting go and letting things run their course. Something is yet to be revealed to get a full understanding of the entire situation. It is a time to use your intuition and dreams to look beyond the surface and discover the hidden. As this card can represent poets and artist, maybe the time has come to discover your hidden talents and possibilities and bringing the out in to the world. As being representative of the hidden and the subconscious, the High Priestess can indicate that a person may need to take some recluse time, literally as a hermit or more metaphorically, in your mind. It is time to reflect on things, think them trough more thoroughly. The High Priestess in a reversed position is indicative of a person that is not in accordance with their inner voice. Busy, stressful life and obligations of the outer world make us forget about what we really want and what our needs are. The time has come to listen to your inner voice either by meditating, taking some time off to reflect and of inward to remember your true self. It is important for all of us to remember that when times get hectic, we can always go inward to our quiet place and come back refreshed and ready for the outer world and the obligations that are put upon us. The repression of feelings and reliance on to others is a common occurrence in people. The High Priestess card shows a need to stop repressing. You may need to search for spiritual of therapeutic help in order to help you express and work trough your repressed emotions as they are a powerful force that governs our lives from the unconscious until we work them trough. The High Priestess represents the feminine energy that comes from within. When this card is reversed, it can indicate a misuse of sexual energy of the person. That can vary from total abstinence to using sexual relationships as a way to manipulate and satisfy the ego. Whatever the way, the person must restore the balance and start living the truth and inner wisdom on that plane of life. For a woman, a reversed High Priestess card can indicate the rejection of the feminine side inside of her and opting for a masculine approach to life. Getting in touch with their emotions and intuition is difficult for most man. Having a reversed High Priestess come up in a reading shows an alarming need for a man to connect to his emotions. With a reversed High Priestess position, a person may have gained insight into the occult teachings and practices, but may not be wise enough to use it correctly. The reversal of this card shows a negative side of the term secret that this card generally represents. This means that the term secret may turn into hidden plans, agendas and gossip that may be going under the surface. It is important that you find the truth and reveal the mysteries in order to protect yourself from the impact of secret and lies.